Things aren’t getting any easier out there. In fact, each year the complexity of construction work continues to increase while the profit margins get thinner. According to the accounting firm Accenture: because of the complexity of projects today, only 30% of firms currently deliver projects on budget and only 15% deliver on time. Statistics like this are why contractors are working hard to improve every area of operations. And what about all the new high tech materials being used in construction? These materials require a new range of expensive tools that need to be purchased and managed. Losing or misplacing pricey tools and repeatedly rebuying them are certainly having an effect on the 70% of jobs that are not being completed on budget. In a challenging construction environment, contractors must save money anywhere they can. If you deal with complex projects that are requiring new materials, new processes and new regulations then you must adapt. New does not have to be bad. In fact, new technology these days is improving service levels and saving contractors time and money, which is greatly improving the profitability of projects. Over time, companies often accumulate tools that have a useful life well past the job for which they were originally purchased. This annual spend on tools builds into an extremely valuable inventory of tools if you are able to retain the tools year after year. For many mid-size contractors this tool inventory is lightly managed, lightly tracked and yet is worth thousands to the business. A current inventory of tools must be tracked and managed. Responsibility needs to be assigned to the current person who is using a tool. This person needs to be able to “accept” this responsibility. This establishes accountability. A method of monitoring the transfer of tool responsibility in the field needs to be practiced. This allows responsibility to move along with the tool. We’ve observed that it’s the 3rd step where most contractors fail to execute. Many well-meaning contractors have tried sign-out lists or Excel spreadsheet “responsibility lists.” These documents always fall quickly out of date and become unreliable since tools move from person to person in the field. As tools are passed from one person to another, the lists are usually not being updated. In an attempt to get a better grip on tool transfers, companies often react with command and control tactics such as not allowing tools to move from job to job without first being checked into the office. It doesn’t take long to discover that these tactics don’t work. In fact, actions that restrict the flow of tools from person to person actually increase a company’s tool costs. Because of the difficulty and delay of requesting and receiving delivery of equipment, superintendents are apt to hold onto anything they might possibly need rather than risk not having the vital tools they require for their projects. This of course slows down the flow to other projects that may need those tools. The slower movement of tools results in the company purchasing more tools than are actually needed. This is not a sustainable practice. Instead of restricting the movement of tools, why not better enable it? Encourage tools to move from person to person and job to job. Regardless whether the moves are formal deliveries or informal personal pick-ups, more tool movement means better tool utilization and that’s just good business. The real key is to make it easy for field people to transfer responsibility along with the tool when it moves from person to person. It must be easy and fast. It must be done in the field without calling the office. It must benefit the field person to do it. Whether you’re evaluating a construction tool tracking system or building your own construction tool tracking process, place your focus and emphasis on how field personnel can easily transfer responsibility while maintaining a record of the transaction. 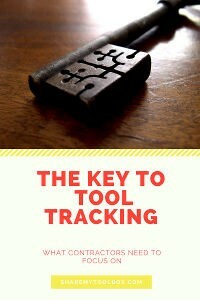 This is the key that determines the success of your construction tool tracking. To learn more about construction tool tracking technology that enables tool transfers in the field, visit ShareMyToolbox Tool Tracking.